London Tea Club is a curated loose-leaf tea subscription born in London, UK, and now based in the Bay Area. Recently, I had the pleasure to meet founder and Bay Area native Cecelia in person and she gifted me with a glass vial full of beautiful tea leaves and tea blossoms. Here are my tasting notes. I used the gaiwan brewing method even if this tea is not typically steeped that way, because it’s become my standard when recording tasting notes. 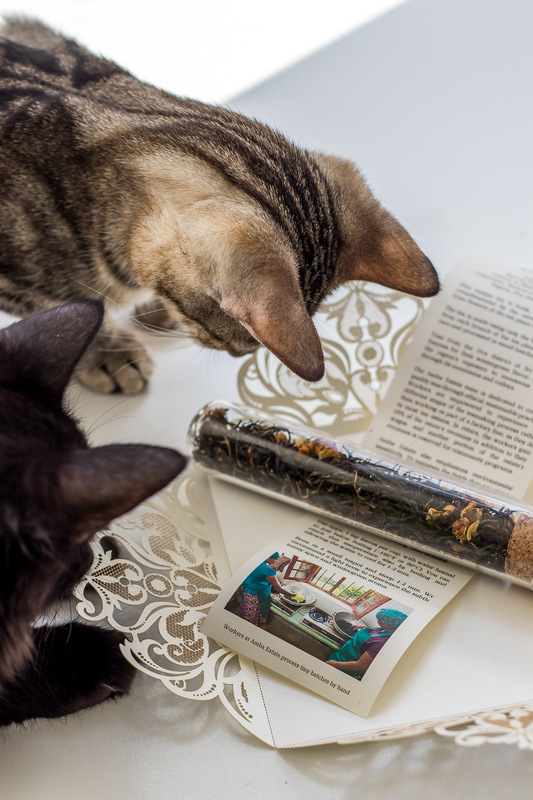 My kittens Lola and Laurel helped me out with the visual assessment of the tea leaves. OVERALL IMPRESSION: a very unique and intriguing tea that comes with detailed information on origin, processing and brewing instructions. I’m very curious about all the teas Cecelia offers to the London Tea Club members. Disclaimer: This is my honest opinion. I am not affiliated with any of the brands mentioned.